UPDATE: At 1 p.m. EDT today, NASA announced plans to use its Orion space capsule design as the basis for a new deep space exploration craft called the Multi-Purpose Crew Vehicle. Read the full story here. NASA is set to make a big announcement today (May 24) about its plans for the human exploration of deep space. The agency will unveil those plans during a teleconference with reporters at 3:30 p.m. EDT (1930 GMT). During the teleconference, officials will "discuss an agency decision that will define the next transportation system to carry humans into deep space," according to a NASA media advisory. NASA's destinations in deep space over the next few decades are already laid out. 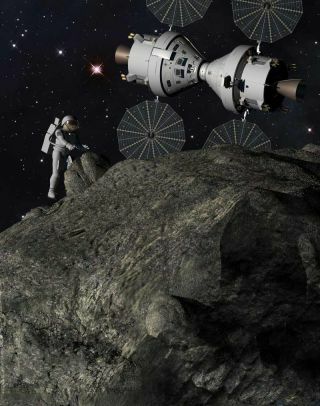 Last year, President Barack Obama tasked the agency with getting astronauts to an asteroid by 2025 and to Mars by the mid-2030s. The transportation decision, whatever it is exactly, should help NASA define itself during a period of transition. In the short term, NASA astronauts will get rides the the International Space Station aboard Russian Soyuz vehicles. But over the long haul, the plan is for commercial American spaceships to provide this taxi service. The agency is working with and funding several private companies, such as California-based SpaceX, to help them develop these new craft.